This page shows you the main features of the Compiler Pro Edition. #SNMP Library used to ship a compiler sample project, which only provides limited features such as syntax highlighting. 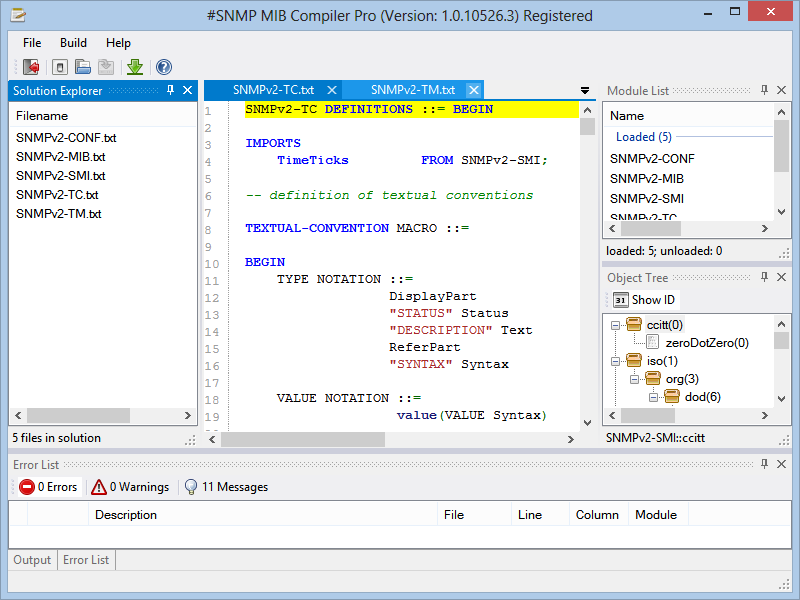 The Pro Edition of #SNMP MIB Compiler, however, is designed and developed to include advanced features that target SNMP professionals and enterprises. Support services can be purchased separately. The Compiler Pro which requires .NET Framework 4.5 and Windows Vista and above. 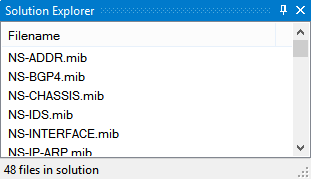 Based on the metadata collected from MIB documents, the compiler can generate appropriate C# code through compilation, which is similar to Net-SNMP’s mib2c utility (who compiles MIB documents to C code). The output C# source files can be used to link with the snmpd sample in #SNMP Library so as to form a simulator for those MIB documents. 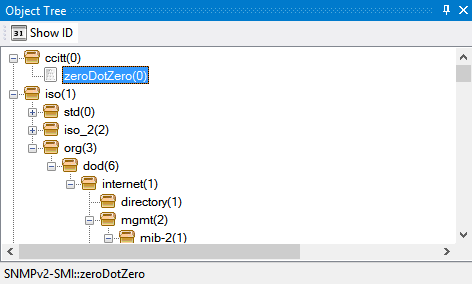 The compiler is designed to be similar to Visual Studio, with dock panels that show various information to assist MIB document authoring. 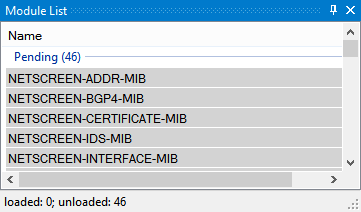 MIB documents can be loaded here. Last used solution will be automatically loaded at startup. Loaded and pending modules are displayed in this panel, so it is obvious which modules are not compiled. Compilation errors and warnings are displayed so it is easy to identify issues in documents. Objects from loaded modules are displayed so the whole object tree is one click away.